What Do You Get a Minimalist as a Gift? 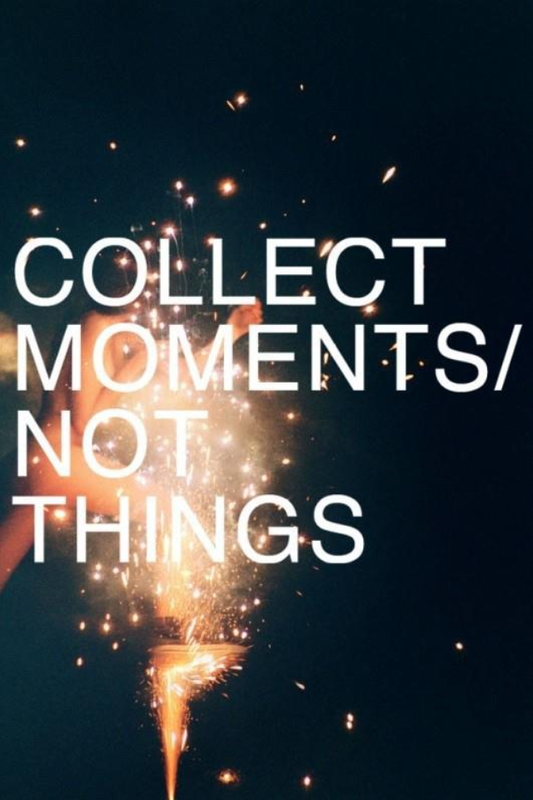 The quick answer is give them experiences, not things. Most minimalist will be happy with this. Of course, to ask the person is key, as minimalism is not a one size fits all way of being. I am really not wanting more “things” in my life and I am so glad that my daughter sees that. This year has been a pretty big year for letting go. I have had 5+ loads of donations picked up by the Vietnam Vets or driven to Community Warehouse. I have given away about 50+ books and 50+ CDs and those layers feel good to be peeling off. I am really enjoying the freedom of having less stuff! What I do LOVE and want to do for my birthday is spending time with family and friends, including my daughter, Myra, and my 9 month old granddaughter, Ava. My granddaughter is at an age now where she has a lot of fun on outings, so I suggested we go downtown and see if I can use my 15% off birthday certificate at Anthropologie. I could use a new blouse (if I find the right one). For me, the trip downtown is more about our time together, than the acquiring of any item. I appreciated not going alone, and seeing Ava as she gets excited by all the colors, textures and people makes my heart sing! 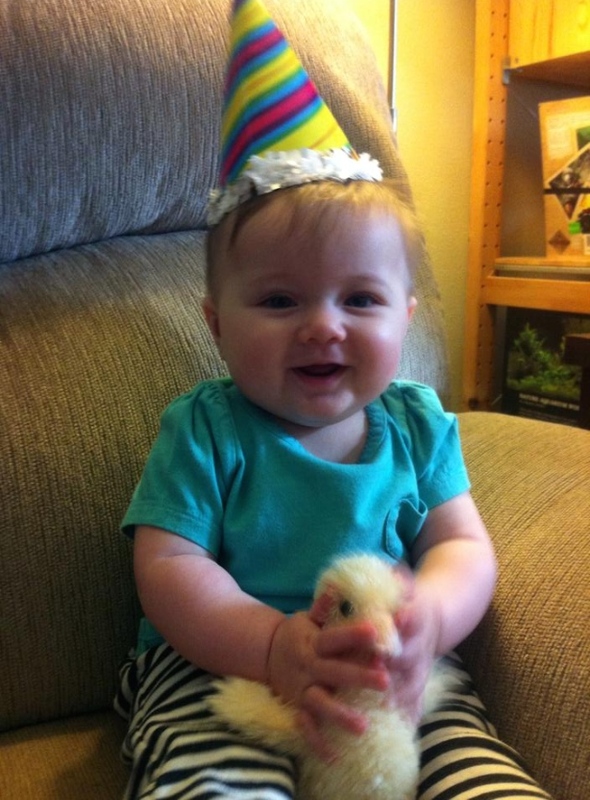 Myra sent me this picture of lil Ava on my birthday. Cute idea to dress her up and send it to Grandma! As it went, we both had old books we wanted to donate to Powell’s, so we brought those along and had donating be part of our day. We spent some quality time at Powell’s and found some new books for Ava. I looked at books, but didn’t feel I had to buy any. Then we had fun at Anthropologie, looking at their beautiful artistic clothes and household items. I didn’t find that blouse I am looking for yet…and that’s OK. Actually, by going for the experience, it took the pressure off me to find a gift just for “gifts sake” if you know what I mean. Think of what they love, and do something that includes that. If it’s books, a trip to the library or time in a bookstore that allows you to hang out, read and get a cup of coffee or tea together. Be generous with your words of appreciation and your time. Do something together. Write a card or note to them. Go for a walk to a new or familiar place. A park or a green area in town or out-of-town is always nice. 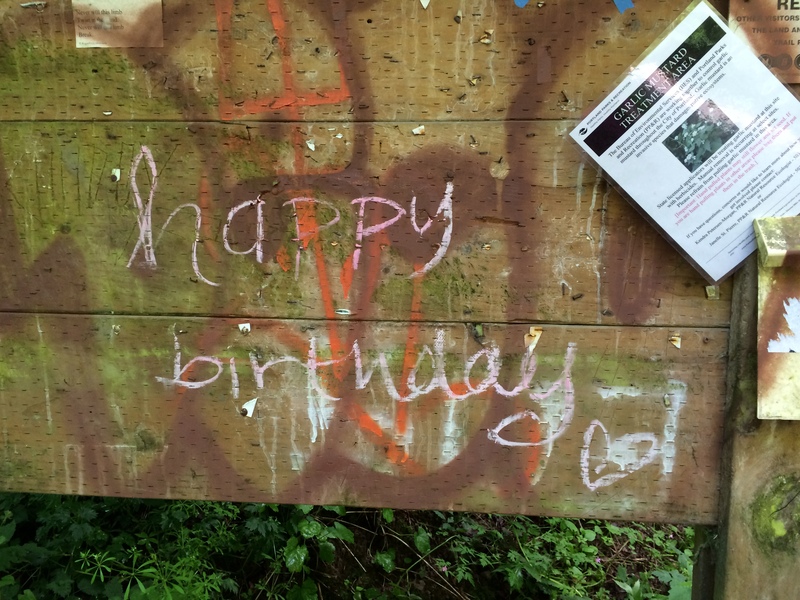 My friend Kathy invited me to do a 6 mile walk in the forest for my birthday and that is truly one of my favorite things. As we talked and caught up on our lives the miles whisked by! We stumbled upon this sign at the end of the walk (not intended for me, but I enjoyed it none the less). Make a favorite dish and invite them to your home to share. Or create a potluck where others can share their cooking skills and join in the conversation. Bring along some games to play after the meal to add to the fun. See a film at home or in the theater. We are fortunate to have discount theaters in Portland. 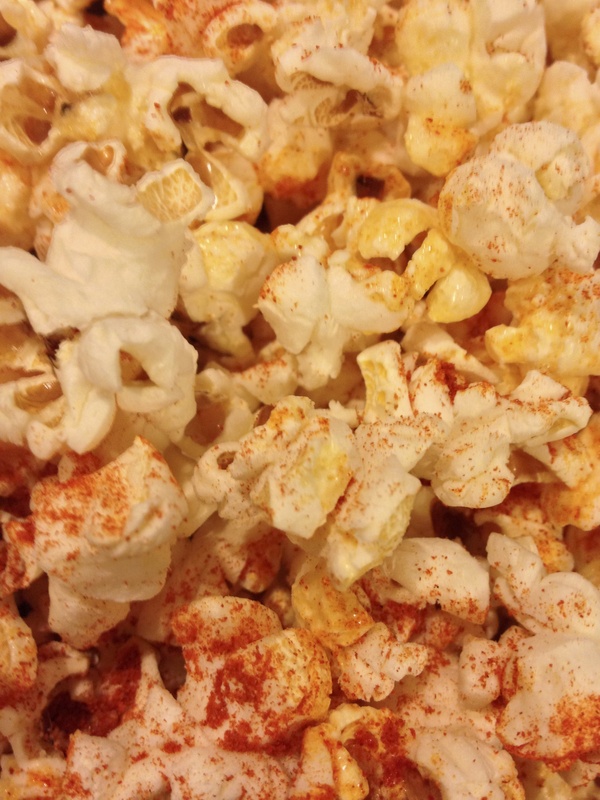 If you choose to do a film at home, you can even borrow a movie from the library or rent one online and make your own popcorn with some salt, cayenne and nutritional yeast on top. Take a class together such as a cooking class, wine tasting class, art class, etc. Visit a museum or art gallery to see art from an era that the person enjoys. Go to a sports event for their favorite team. Go to the Farmers Market together. You can check here if you are outside Portland. 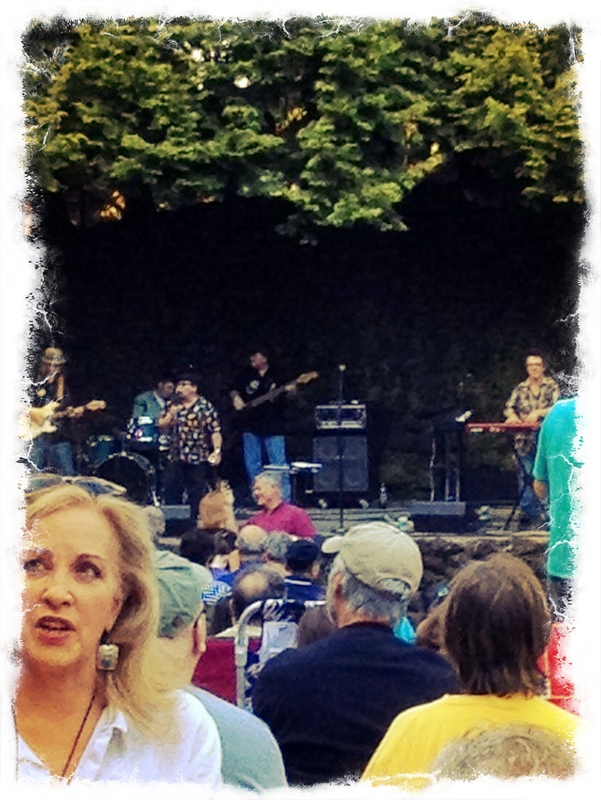 Attend a free concert or movie in the park during July or August. Take a short road trip to visit friends or family together. Bring along some music, beverages and snacks to make it even more fun! Become a tourist in your own town and go to a free or inexpensive tour or event together. If that isn’t enough, we also have the Big Weekend Events Calendar. Google “free” and the name of your town to find fun things in your area. So here’s to celebrating by connecting with what you truly love to do and doing it with those who make your heart sing! What are your ideas of fun things to do that you’d like to add? Please post in the comments below. If you liked this blog, please subscribe to future blogs on my home page by clicking the “follow” button and providing your email. Your email and privacy are protected and won’t be shared. Thanks! Great to hear the list will help you get some good ideas for your guy. I hope he has a wonderful birthday! Thank you. I hope yours was wonderful also. Thank you! What a great idea! And 100% of the money goes to the actual charity. Love it. Great ideas, Kathy and I love Ava’s photo!